Web Site Stats - Submarine Wedding Anyone? Hawaiian Island Weddings web site has seen a significant increase in visitors in the past few months. Besides being one of the oldest Maui wedding companies, and getting credit from Google for that, and besides being #3 in current search results for the term "Maui Weddings", a recent article in the popular magazine Rich Man has definitely given the web site a tremendous boost over all Hawaii wedding websites that we have researched. The magazine, which is produced in Japan and is written completely in Japanese, cover feature story was "Amazing Weddings" and featured Hawaiian Island Weddings most unique wedding package, The Submarine Wedding, see details at http://www.hawaiianislandweddings.com/maui_weddings/submarine_wedding.html. 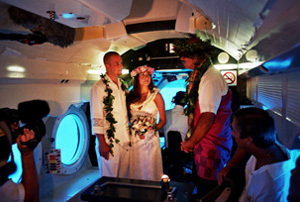 The Submarine Wedding was the brainchild of Hawaiian Island Weddings founder and CEO Tim Clark. As Hawaiian Island Weddings is consistently increasing it's inventory of fun and unusual wedding packages, back in 2004 Tim Clark invented the concept of performing weddings in a real submarine at 150 feet underwater. "It had never been done before, and I figured there may be a market for a wedding as unique as this one", Mr. Clark stated at a press conference in 2005. The wedding is a lot like many of the packages that Hawaiian Island Weddings produces every week; your choice of Minister to perform either a Christian or non religious ceremony, musician to perform the Hawaiian Wedding Song and other appropriate love songs, professional photography (by Mr. Clark who is an award winning professional photographer), videotaping services, complete coordination down to the renting of the wedding attire, selection of rings, hotel accommodations, and more if needed. This wedding couple also added 10 white doves released from atop the sub at sea, additional bottles of Champagne for the guests on the return boat trip, and music by one of Maui's premiere musicians Jamie Lawrence. The submarine can accommodate 40 on a regular tourist dive, but is limited to 20 when a wedding takes place aboard. The submarine is run by Atlantis Adventures, who run the same operation in Oahu, Hawaii (the Big Island), and in the Caribbean. This ultra modern, comfortable air conditioned real submarine is capable of diving to depths of over 150 feet and is a favorite tourist attraction. The Maui sub takes visitors down to the sunken shipwreck "Carthaginian", a 1800's whaling ship which itself was a tourist attraction in Lahaina harbor for years until its purposefully sinking in 2005. The regular tourist activity price is about $90 per adult. Although this sort of wedding is clearly not for everyone, the adventurous wedding couple can bring their closest family and friends to their wedding in Maui that will never be forgotten. This wedding is truly "The Ultimate Hawaiian Wedding"!